Load up the kids and head to the doc? “Yay!” Said no mom ever. Now you can be sick and stay home. Let me tell you about last November, which I alluded to in early January via Hot Chocolate 15K. In early November 2016, I got sick. It lingered. On and on and on, despite my best efforts using all the natural and holistic ways to feel well again. I was surprised when no progress was made because this works for me like 90 percent of the time because of all the ways I practice for never getting sick). But I wasn’t getting better, and I knew I needed to see a doctor. I went in and found out I had a severe sinus infection. I went on the dreaded (yet critical) antibiotics because I needed them. And all because I waited so long. Had I known then what I know now about Express Care Virtual, this would have been completely avoided. Disclosure: This is a paid, sponsored post in partnership with Providence St. Joseph Health. All opinions stated here are 100% my own. Learn more about and connect with them on Facebook, Twitter, or Instagram. I believe that services like Express Care Virtual for basic medical needs is the future of health care services. 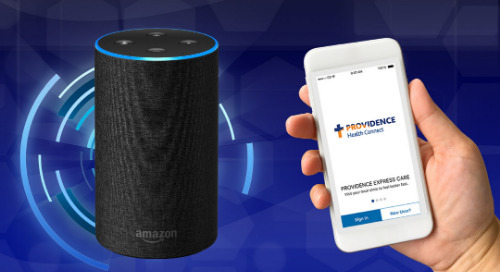 Express Care is one of the ways Providence St. Joseph Health is making health care more accessible and convenient. Download the app and within 10 minutes, you are video chatting with a health care provider. Or, if you need that personal touch, they’ll send a provider right to your home. You never have to leave the couch. Rarely would I ever write a sponsored post like this on my site, but this service is incredible. I didn’t just read up on this and write about it - no. Instead, I actually went through the convenient process as if I actually needed to use it so I knew to use it next time. The first thing to make note of, though, is that this service is currently only available in California, Oregon, Washington, and Montana. There are plans to expand it. Sign up and login (you only need to do this once). The app will connect you with the provider. Your virtual visit will begin. During the appointment, the provider will go over your medical history and will conduct an exam. For example, if they need to look down your throat, they can do so by having you hold a flashlight (or even phone flashlight) near your mouth. They are able to give recommendations, and even prescribe medication if needed. Here is a list of conditions they are able to treat virtually. The process was easy as can be. And after the visit is over, they will make a follow-up call to you within a few days. Not to mention they are always sure to provide you with a full visit summary. Our children always seem to come before us. I don’t always let them, but a lot of times I do it, too. When it comes to illness, though, how in the world are we supposed to make sure food is on the table, hugs are given, buns wiped, and every last need is catered to if we are sick, rundown, and barely able to keep up with our own bodies? These days, I rarely take Amiya, Isaiah, and Samarah in public alone, let alone taking all 3 of them to the doctor when I’m not feeling well. I can’t tell you enough how invaluable a service like this is. Some areas even have a care at home feature where the nurse will physically come to your home on a moment’s notice. You can read more about that via Care at your doorstep with Express Care at Home. What do you think? Is this a service you would use? How? If it’s not in your state currently, would you like it to be? If trick or treating isn’t for your little ones, try these 10 fun activities instead.